As the “war goddess” Hurricane Irma* barreled toward Florida, I asked Air Force veteran, first responder, and Ground Zero Chaplain Bob Ossler to provide insights from his service during natural and man-made tragedies. Bob served five tours of duty in the aftermath of 9/11 at Ground Zero; volunteered in the Super Dome after Hurricane Katrina in 2005 as a triage paramedic and chaplain; and comforted surviving family members after the Yarnell Hill, Arizona wildfires that killed 19 members of the Granite Mountain Hotshot firefighters in 2013. He also responded on the ground after the police shootings in Dallas and Baton Rouge in 2016. He’s preparing now to respond to physical, emotional, and spiritual needs that arise in Florida in the aftermath of Hurricane Irma. Adversity is Bob’s calling. Triumphing over terror is his passion. Q: With Hurricane Irma barreling north through Florida and Hurricane Harvey’s destruction on media display, what memories does this stir up for you? A: Anyone involved in any natural or man-made disaster experiences flashbacks and anxiety related to their own experiences. We can’t escape getting pulled back into those vivid memories. Watching updates on Hurricanes Harvey and Irma stirs these buried anxieties. We relive old scenes from Hurricane Katrina: people stranded on rooftops waiting to be rescued, many escaping floodwaters with only the clothes on their backs; homes and businesses destroyed; jobs and livelihood lost; abandoned pets; and worst of all, floating bodies in the stagnant water. You cannot erase scenes like this from your memory banks. They cycle and recycle through your thoughts and dreams. In the Super Dome after Katrina, between 15,000 and 20,000 people crammed onto the arena floors and bleachers. Frustrations abounded: Lights on 24 hours a day. Constant noise: babies crying, people talking, sounds echoing, music playing. Long lines for food or to use the overcrowded bathroom facilities. Wearing the same clothes day after day after day. Obnoxious smells assaulted our noses, and at times, we held our breaths until we passed the worst areas. Mounting garbage piles, dirty diapers, rotten food in the trash created these smells. The mass of people crammed into the Dome brought out the best—and worst—in people. While most people were courteous and flexible, others were not. Small frustrations occurring in normal situations exploded into noisy, tension-filled conflict in over-crowded, emergency shelters. Personality conflicts among the crowds heightened even more anxiety. Feelings of helplessness and hopelessness dominated the scene. The big questions, often unspoken, loomed like a black apparition of doom: How long will we stay here? Did our homes survive the destruction? Where will we go from here? How will we survive without homes and jobs? Police dealt with maintaining order and safety for citizens, but they also handled lawlessness and looting in devastated neighborhoods. In the Dome, they broke up fistfights and out-of-control arguments. Security checkpoints searched for and confiscated alcohol, illicit drugs, and weapons. Even so, police and security officials acted with courage and faithfulness to their duties. Emergency services personnel and others assisting in rescue and recovery efforts smother their own anxieties and fears in order to remain strong for those who need aid and comfort. On the positive side, local and national volunteers poured in to assist those stranded in the Super Dome. Communities pulled together in these tragic events, and the best of humanity emerged: cooperation, selfless giving, sharing, and listening to those who needed to vent. Other precious memories of my time serving after these tragedies bring me almost to tears. I recall specific heroes in each tragedy. I remember many names, both of victims and the many emergency services personnel who responded to the call to provide physical and emotional support and encouragement in extreme conditions. I remember intimate conversations with suffering people, their questions about God and suffering, and their requests for prayers for themselves, their families, and those around them. Now I get on my knees and give thanks to God for these hard-working service providers and volunteers, as well as for the abundance that he has given me, my family, my friends, and associates. I see how God works using His people to serve others in need. This is the powerful, heart-fulfilling blessing that emerges from tragic times. Q: What job were you assigned when you arrived at the Super Dome in New Orleans? A: I was a triage paramedic and met with people to determine their level of need for medical services. I also handed out basic necessities: water, toothbrushes and toothpaste, deodorant, even candy treats for the kids as I mingled in groups of displaced persons. At the same time, many people expressed questions about faith and God’s purposes in these tragedies. When asked, I shared how my faith helped me through difficult, heart-breaking situations. Many people asked for prayer for themselves and family members and reported feeling less anxious afterwards. Of course, since giving hugs is one of my trademark ministry techniques, I gave and received many of them. Q: What was the most difficult part of serving people stranded in the Super Dome? A: Chaplains, counselors, and sympathetic volunteers listened constantly to people as they poured out their hearts. We worked to the point of exhaustion, then worked longer on little sleep. The physical, emotional, and spiritual needs of the people were overwhelming, and we couldn’t let them down. Despite not being able to answer their biggest questions, we gave them our time, presence, listening ears, and prayers. We met many new friends there and wanted to do our best to help them survive this terrible situation. Q: How did serving others impacted by 9/11 and Katrina change you? A: During and after each disaster, I take time to think about my blessings: my wife, my family, my home, my friends, and my work. I recommit myself to serving them and others and to sharing my faith when opportunities arise. I’m now a much more sensitive person to other people’s needs, and I want to help in any way I can. I see a person in pain, and I reach out with a hug, some kind words, a listening ear, a prayer of encouragement, and time. Q: What ways can people serve after a natural disaster? A: People can help in many ways. Donations of money help, of course, but volunteering in the long term will provide good will, encouragement, and hope for many. Organizations and churches form work parties to pitch in to help in the clean-up efforts, which will most likely go on for years. Join with these local groups and volunteer time and/or money for building materials. We’ve already seen how neighborhoods work together to pull out wet sheetrock, ruined furniture and carpets, and destroyed appliances and equipment from devastated homes. That demonstrates the best of humanity in adverse conditions. Donations of clothing help, but be sure that the donations are gently used, freshly laundered, or new and appropriate for the weather conditions of the affected area. Winter coats, scarves, and hats are not needed in a temperate zone. Think about your own daily needs. The simplest things can help a lot. Babies need diapers. Toddlers need pajamas and play clothes and shoes. Everyone needs personal items like toothbrushes and toothpaste, razors, soap, and shampoo. Everyone needs encouragement and prayer. We take so much for granted in our lives. Let’s give from our abundance. When we give goods or services to others in need, we become the hands and heart of God. 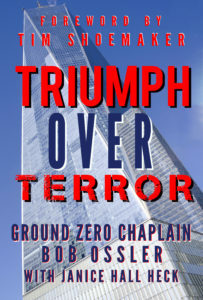 In “Triumph Over Terror,” Bob Ossler with Janice Hall Heck relates his experiences at Ground Zero. As a professional doing his job, Ossler served five tours of duty in the weeks and months following 9/11. Bob narrates invaluable eyewitness vignettes recounting the fears, struggles and sacrifices of the Ground Zero workers. He chronicles the profound outpourings of heartfelt generosity and heroism from strangers and Americans who just wanted to do “something.” Bob’s first-hand account reminds all Americans to “never forget to honor” the bravery and ultimate sacrifice of first responders who rushed toward terror in hopes of saving civilians. Published by Blackside Publishing and available in paperback or ebook on Amazon. 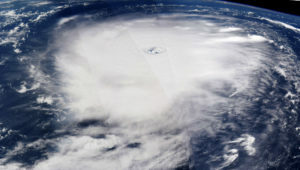 * The German meaning of the name Irma is from the Old German ‘irmin,’ meaning War goddess.